When you visit your doctor with complaints of shoulder weakness and pain, your doctor analyzes your medical history and performs a thorough examination of your shoulder. Your doctor may order imaging tests such as X-rays, MRI or ultrasound to confirm a diagnosis of rotator cuff tear. Sometimes, a shoulder arthrogram is performed, where a dye is injected into the shoulder joint and a series of X-ray images are taken. If the damage is a partial tear, the degenerative tissue of the tendon is cut out and removed along with any loose fragments (debridement) and the tear is left to heal on its own. 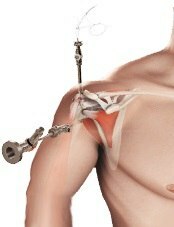 Acromioplasty may be performed where the end of the acromion is reshaped to take pressure of f the rotator cuff. If a bone spur is causing the tear, the spur is removed, and the torn tendon is sutured. If the tear is complete, the degenerative tissue of the torn tendon is removed, and acromioplasty may be performed. The humeral bone head where the tendon was previously attached is cleansed and holes are drilled into the bone. Suture anchors are inserted, and the tendons are sewn back to the anchors on the bone. Once repaired, the instruments are withdrawn, and the incisions are closed.